VYUsync Design Solutions is a product engineering company delivering intellectual property cores and hardware platforms in the high definition video processing domain. With extensive expertise built over a decade, VYUsync today offers a wide range of HEVC, AVC, MPEG-2 and peripheral IP cores for broadcast quality applications.  VYUsync is now recognised as a preferred vendor by leaders in the broadcasting industry for its highly optimised IP cores delivering unparalleled performance. VYUsync leverages its IP portfolio to develop custom hardware platforms designed to meet the most demanding applications. The modules are available both as standalone units and proof of concept platforms enabling our customers to minimise risk and reduce time to market. Every one of our offerings allows for a great deal of customisation enabling our customers to tailor them to their requirements. Build new solutions or upgrade existing ones with VYUsync’s easy to integrate IP cores. Implement complete solutions deploying one or more of our encode, decode and peripheral IP cores. Adopt the field proven IPs to get to market faster and with a lower total cost of ownership. 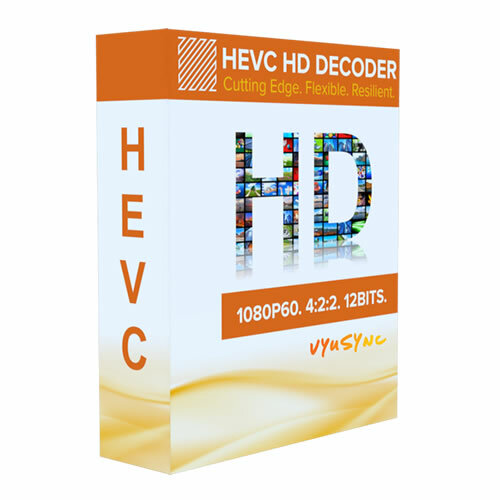 The HEVC HD Decoder Core by VYUsync is a highly optimised video decompression engine targeted primarily at FPGAs. The decoder achieves real-time performance for high definition (HD) video with ultra-low latency & optimised resource utilisation. It is well suited for various applications ranging from broadcast and professional video to high end consumer electronics. 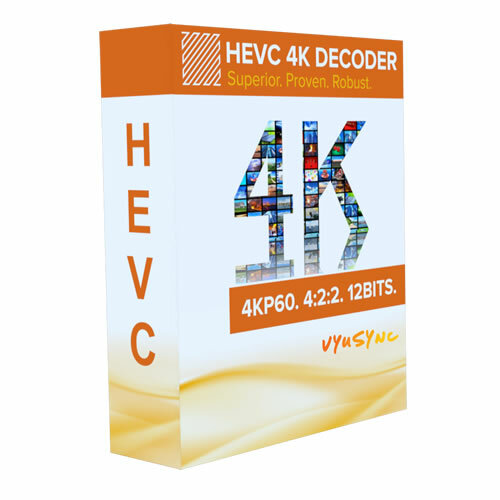 The HEVC 4K Decoder Core by VYUsync is a highly optimised video decompression engine targeted primarily at FPGAs. The decoder achieves real-time performance for 4K ultra high definition (UHD) video with ultra-low latency & optimised resource utilisation. It is well suited for various applications ranging from broadcast and professional video to high end consumer electronics. Pristine colour reproduction with support for the 4:4:4 colour format and larger bit depths than even before. The AVC Decoder Core is a highly optimised, high resolution decompression engine targeted primarily at FPGAs. It is well suited for various applications ranging from broadcast and professional video to high end consumer electronics. 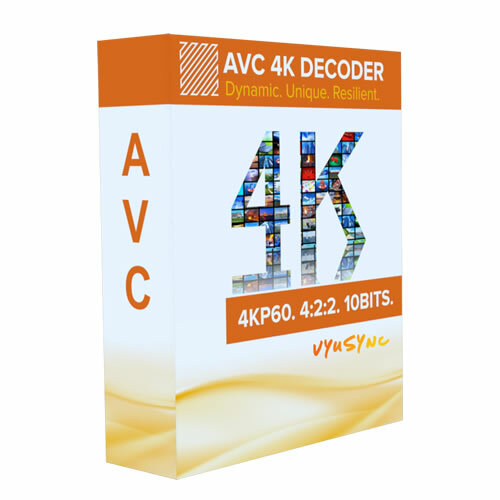 The AVC 4K Decoder Core is a highly optimised, high resolution decompression engine targeted primarily at FPGAs. It is well suited for various applications ranging from broadcast and professional video to high end consumer electronics. High fidelity, low latency encoder employing AVC Intra prediction only for video production, contribution and medical applications. Resource optimised AVC Intra frame only decoder. Pairs with the Intra Frame Encoder to enable ultra-low latency video transmission links. 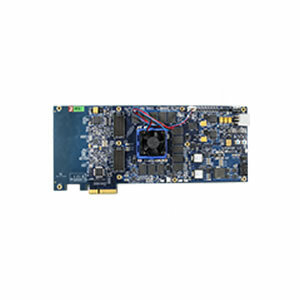 The MPEG-2 Decoder Core is a high performance and high quality solution video decompression engine targeted primarily at FPGAs. It is compliant with ISO/IEC 13818-2 (H.262) standards. Extract multiple video and audio elementary stream from single or multi program transport streams. Flexible, compact solution to package elementary stream output from encoders into a transport stream. Pair with any of the decoder solutions to drive baseband video output over serial or parallel interfaces. Minimise development times and get to market faster with VYUsync’s hardware offerings. Let our cards and modules abstract the video decoding process to a black box function so you can focus on higher level system functions. PCIe card with Xilinx Kintex Ultrascale FPGA for high density HD or real time 4Kp60 encoding and decoding. Compact form factor card with Xilinx Kintex-7 FPGA optimised for single channel HD decoding. Connector card for Myrmidon with 5 In or Out configurable ASI / 12G-SDI connectors, 1 Genlock In, 1 Gigabit Ethernet interface and provision for audio decoding. FMC card with 8 ASI / 6G-SDI ports each of which can be configured as In or Out, 1 Genlock In, 1 Genlock Out and 1 Gigabit Ethernet interface. 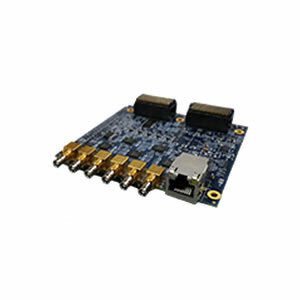 FMC card 4 ASI/6G-SDI In, 4 ASI / 6G-SDI Out, 1 Genlock In and 1 Genlock out compatible with a host of Xilinx evaluation platforms. FMC card with 2 ASI In, 2 ASI Out, 2 SDI In, 2 SDI Out and 1 HDMI output compatible with the Xilinx ML605 platform. Card with two parallel male FMC connectors used to connect two Nimbus cards together to enable inter FPGA data transfer. Card with two orthogonal male FMC connectors used to connect Ceres cards to Nimbus cards. Opposite chirality of Jadukata. Card with two orthogonal male FMC connectors used to connect Ceres cards to Nimbus cards. Opposite chirality of Saraighat. More Information or Product Quote?